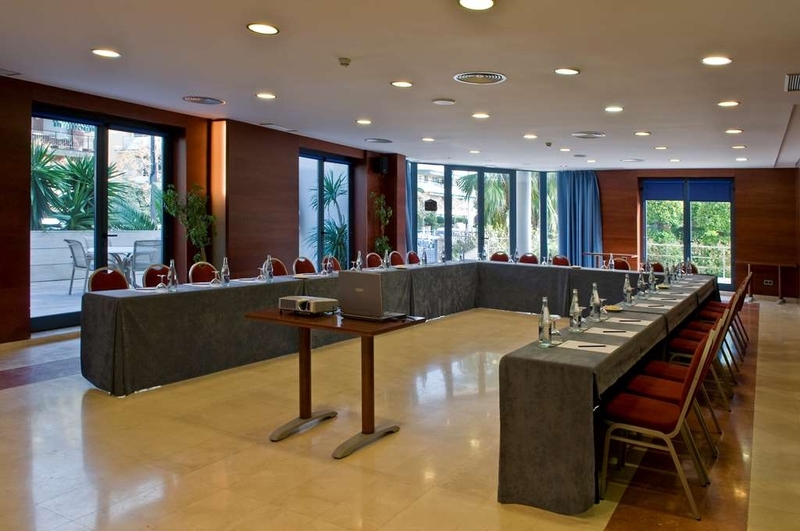 The Best Western Hotel Mediterraneo is ideally located in the center of Barcelona. Come and experience our hotel near the major tourist attractions. Best price guaranteed and exclusive deals. 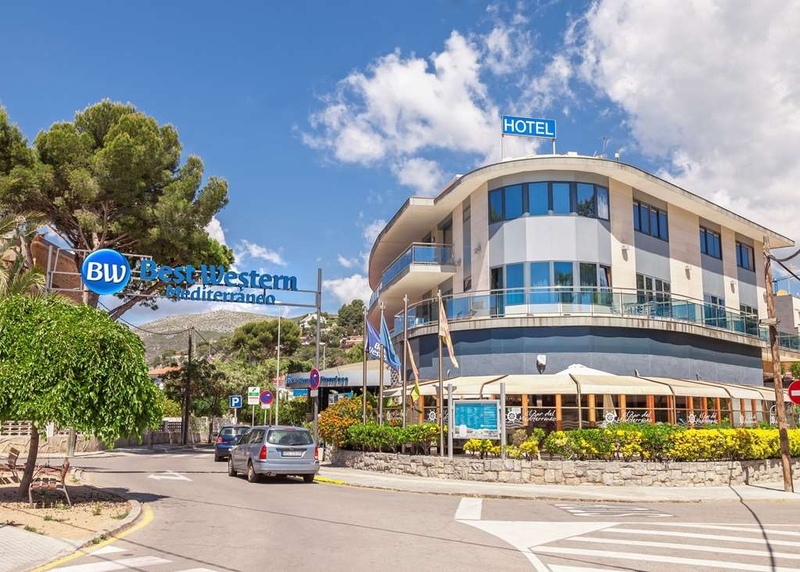 Situated 22 kilometers from Barcelona, in Castelldefels, the Best Western Hotel Mediterraneo is a charming hotel with nice rooms, pool, excellent restaurant and a friendly crowd always willing to help you. 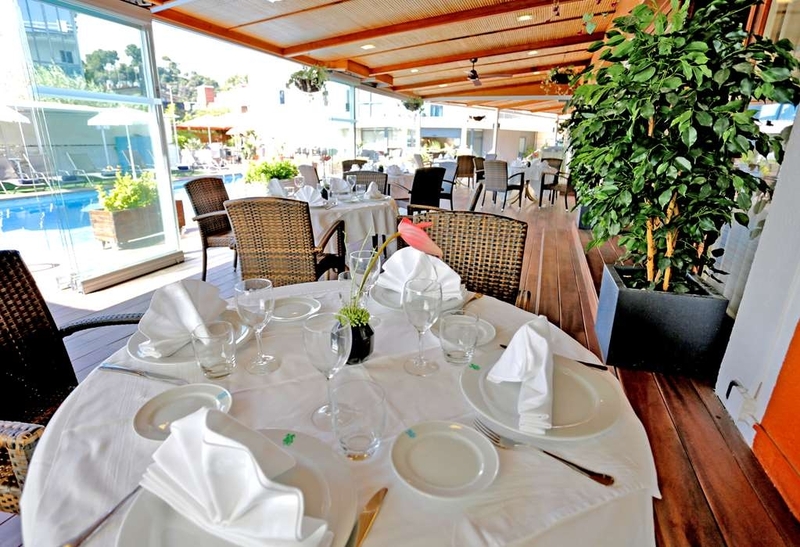 It is located at the sea walk of the beach of Castelldefels, a little village just 20 minutes south of Barcelona. 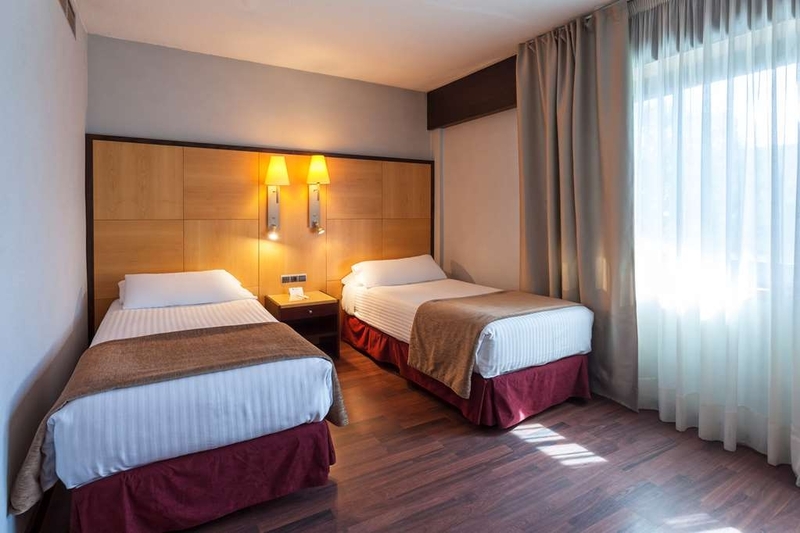 The hotel is next to the train and bus stop to Barcelona Center as well as very near to Barcelona Airport (15 minutes) and Barcelona Congress Area (20 minutes). 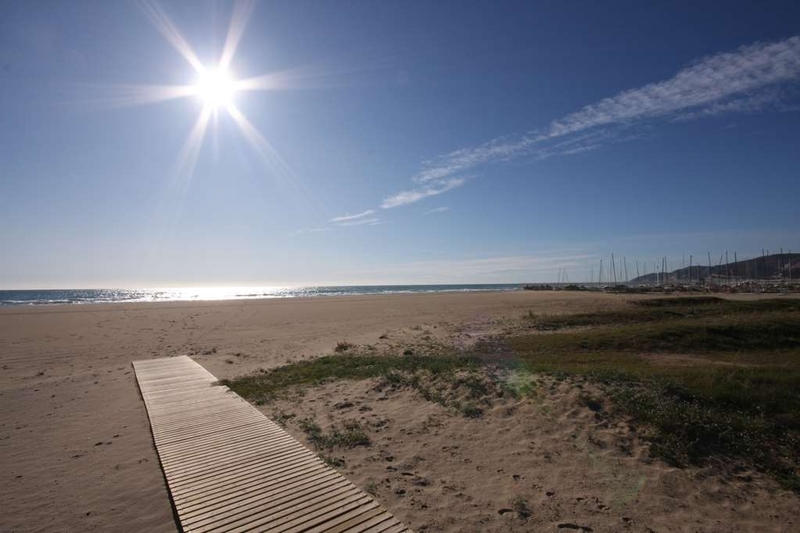 The Castelldefels beach is a very large, quiet and peaceful soft sand beach, perfect for walking, swimming and relaxing. Being the opposite of an overcrowded summer resort, Castelldefels is suitable to visit all year through. Our lovely village is popular amongst the Barcelona native people for the little high-quality restaurants and cocktail lounges. 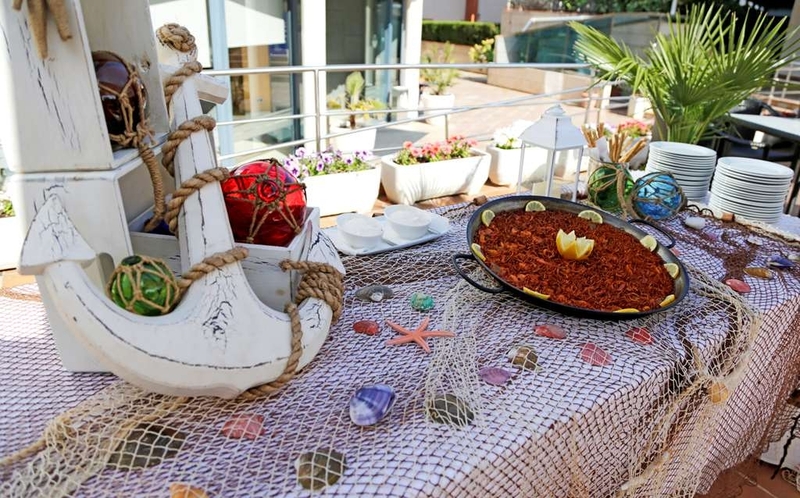 The Best Western Hotel Mediterraneo is the perfect destination to rest and relax. A tourist tax is applied in Catalonia of 1. 21 EUR per person per night. It's counted for 7 days of continuous stay, exceeding days will not include the tourist tax. The additional tax is not included in the rate booked and must be paid at the property. All children under 16 years of age are not subject to payment of the tax. Enjoy your stay. I enjoyed very much my stay. My room was big and well furnished. The hotel is near the sea, with a nice terrace and swimming pool. The breakfast was excellent with fresh fruits. The rooms from the conference center are quite good although you may sometimes hear people in the adjacent rooms. I would go back. 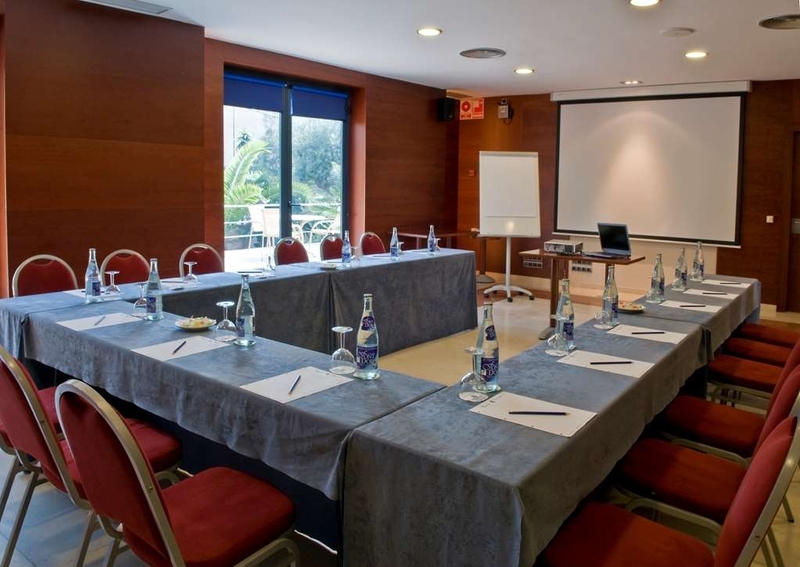 The Best Western Hotel Mediterraneo is located near the excellent Castelldefels Beach. 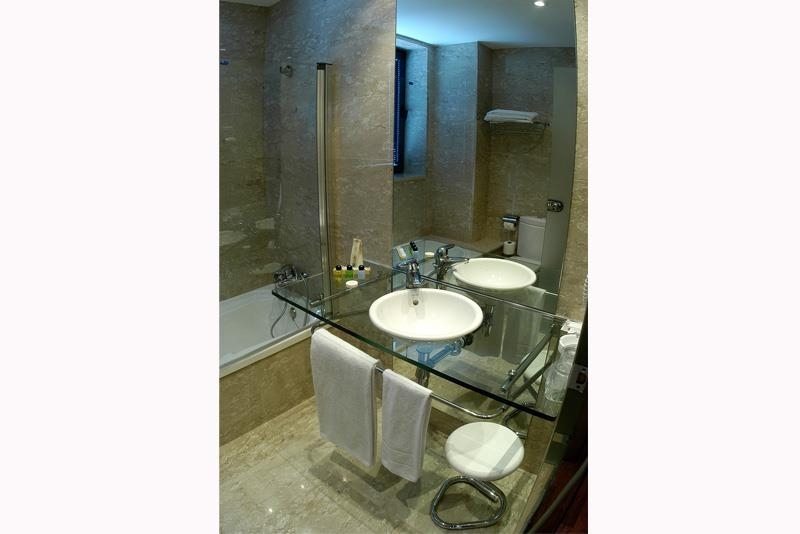 It is within walking distance to the train and you'll be in the city centre within 30 minutes. Great pricing and excellent rooms/quality. If I ever return to Barcelona this is where I will stay. A super hotel, perfectly placed for beach, restaurants and local shops. Comfortable beds, friendly staff and good room service. Excellent value for money, and a lovely outdoor pool area (although I did not use in February). I will definitely look to return. Traveled for the italian holiday of the Festa della Repubblica and was surprised of finding such a cozy retreat space within the most exciting city of Europe, Barcellona. Had a great time in this nice place. The staff was very friendly and attentive. very nice hotel with fantastic location; no traffic jams, near to the airport, breakfast from 7 a.m., staff very friendly; very good for business trips; restaurant inside; nothing to complain; in the summer even small swimming pool inside. This was our first visit, it certainly will not be our last.... what a fantastic place. Everything is so perfect, staff are lovely and friendly, location is perfect, rooms are great...really is a lovely hotel. Many thanks to Tizianna for my emails back and forth to sort a room before my arrival, you and the rest of the staff are a credit to the hotel. We will see you soon, Many Thanks. I can't say enough about this gem of a hotel. We stayed there in September of 2017 and were compelled to return as the hotel is not too big and all the Management and Staff make you feel like family and upon our return this year we were greeted with a warm welcome and even a few hugs. The rooms are well appointed and our breakfast was included. It is across the street from a beautiful 5 km. stretch of beach and a lot of beach restaurants to choose from. Walking distance to the local train station (purchase a T10 which gives you 10 trips that can be shared) and 23 minutes to Barcelona Sants train station. 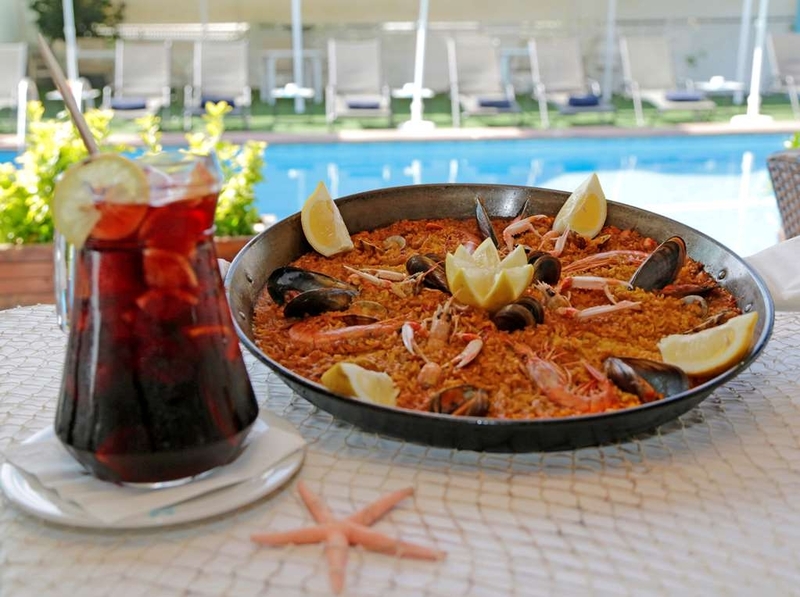 The hotel has a great restaurant and patio where we enjoyed several meals - the best Paella ever and they also offer a Menu del Diari that is very reasonably priced. You have to know the food is good when many Spaniards and their families or tourists from other hotels come here to eat. There are also many restaurants (and a grocery store nearby that also sells beer and wine) within walking distance offering a variety of specialty foods. Anna and her staff are truly amazing and they give you a lot of assistance and attention. One very special person is Carmello who seems to do many many things at the hotel and is always taking special care to make sure you are enjoying your stay. We will return again as it is so special here. I can't say enough good things about this hotel. We spent 8 days here mid-September. We had a nice room with a view of the sea. The location was great. We had big suitcases and a carry on each and had no problem taking the train from the airport. We spent 3 very full days in Barcelona seeing the main tourist sights. The train was as fast and easy as reported. Do a little research to figure out where you want to go when in Barcelona, very good connections to busses and Metro but you have to know where you are going. It was so nice at the end of the day in the city to get back to quiet Castelldefels!! The beach was beautiful, water was warm. We rented chairs and umbrella on the beach many days, 6 euros each (18 for 2 chairs and an umbrella). Never crowded! Great for walking. The pool at the hotel was nice, shade under the umbrellas if you want it. The water was cool, not nearly as warm as the ocean. Great to have breakfast beside the pool. The rooms were nice, kind of an old world charm. We liked the convenience of the 2nd floor (considered first floor in Europe), up a quick flight of stairs to the room. The bed was firm but nice linens. There is a fridge stocked with items for purchase. We took those out to put our things in. The shower had great pressure. There is no North American outlet, you need a converter/adapter for any plug ins. There is no clock in the room so bring one if you, like me, want one beside your bed. The internet was good, and there is a computer and printer in the lobby to print boarding paqsses. Breakfast was good, some nice pastries and fresh fruit! Good coffee. We were thrilled with our choice, the staff was wonderful, Castelldefels felt very safe, great beach. We took the train one stop over to the main (small, walkable) city of Castelldefels which has many stores, cafes, restaurants, a shopping centre and even a movie theatre. I think this hotel is a best kept secret, good value too, we couldn't be more pleased and will definitely be back. After a beautiful week in Barcelona center we wanted to spent our last honeymoon days somewhere more quiet and relaxed. The location for this hotel is very nice. The beach is just across the the street. Perfect. Very nice pool. The stuff was very helpful. A big thanks to hotel maids. The girls were so friendly and positive every day. Service was very good. The minus was the beds. They were to hard for us. We had standart double room. We wanted one big bed but the room had two seperate beds push together. If there would be extra one big mattres on top maybe it would be much comfortable but the beds was on the wheels so they moved all the time. Another minus would be the small blankets instead of comfortable puffy white big blanket. Breakfast was ok but it would be nice if there would be more hot meals like porrige, patatoes... Over-all the hotel was very nice and clean. If you are looking for a hotel that is family friendly, offers delicious food and has the most ideal location, then this is the place for you. You cross the road and you are at the beach, you walk 5 minutes and you are at at train station, you walk 2 minutes and you are at the super market and if choose to eat outside of the hotel you have about 100 different delicious places to choose from. Our experience at the Best Western from start to finish was flawless. I have never stayed in a hotel where I have felt so welcome before. I would like to especially thank the hotel manager and Bilal for making me and my partner smile everyday! I will DEFINITELY be coming back next year!! The location: 5* - Couldn't have been more ideal. (Please see attached train information on how to get to Barcelona). The service: 5* - Everyone who worked at the Best Western Hotel made a real effort to make sure we had the best experience. The look and feel: 4* - Everything was kept very clean. The pool was great and the restaurant was lovely. The food: 5* - The menu changed every day and it was all delicious, so it was so hard to choose. Be warned though that the portion sizes are big, so go to the restaurant very hungry!! "Lovely Hotel, Perfect Location, Amazing Staff"
We found this hotel on a Half Board Packaged Holiday with EasyJet and what a find it was! We had the choice out of this hotel and another one that was further away from the beach, but my oh my am I glad we chose this hotel. Located a 2 minute walk absolute tops from the beach, 2 minute walk to the nearest supermarket, 3-20 minutes for a wide choice of bars and restaurants, 5 minute walk from the station to get a 30 minute train to Barcelona and 15 minute taxi ride from the airport - we really had struck gold! We had every evening meal in the restaurant, every evening the food was different and amazing quality - they fill your plate well so we would never go to bed hungry. Breakfast in the morning again was filled with choice and you have the option of having it by the pool or inside. Breakfast is going on till late morning so you can sleep in and not miss the chance to eat. Our room was perfect, with comfy beds and a fridge, we even had a larger than normal balcony, the only downside I would say is I think it was above the kitchen so we did hear the clattering of plates late in the evening, but this is just how it goes sometimes. The pool is well kept with plenty of choice to lie down and relax. We were so well looked after, the reception staff all spoke good English, other staff did not but it was enough to make us feel welcome and their charm and friendless was infectious anyway. Big shout out to Bilal who was an absolute gentleman to me and my girlfriend and made our stay just that extra bit special. We checked in very late at night/early morning and a very nice older gentleman who always seemed to be working around the hotel greeted us with charm and was also another character who made our stay so special. If you are looking for a holiday close to a beach with lots of options nearby then choose this hotel - you can read reviews and ponder about whether or not this is the hotel for you, but this really is the hotel for you. You won't regret it by choosing to stay here. 7 days was perfect for us but you can always do less or more. Thank you Best Western Hotel Mediterraneo and hopefully see you again soon! "High Standard has been maintained!" We have spent an enjoyable, relaxing week at the excellent family-run hotel this year once again as in 2017 and 2016. We are constantly impressed by high standard of the care of the rooms by diligent staff as well as the friendly atmosphere. The restaurant is excellent as are the wines on offer, moreover the prices are very fair. As in our review in 2016, we highly recommend the BW Hotel Mediterrano and its staff and management. Stayed at Best Western , Castelldefels, lovely hotel, nice and quiet. Friendly staff from the check-in and during our stay. The food was very varied and plentiful! Very nice pool, very, very clean environment. Our room had a nice balcony with a sea view. "Superb hotel, less than 5-minute walk to beach too." We've stayed here a whole week and checking-out in just a few hours. The rooms are cleaned every day to a very high-standard. The breakfasts have a superb choice of foods available. The a la carté menu for evening meals, is in our opinion, better quality than any other eatery we could find within a 15-minute walk. The beach is long and beautiful. Platja Castelldefels is the nearest station, an 8 minute walk from hotel. You can travel to Sitges in one direction (worth the visit) and Barcelona and the airport in the other direction. Do make sure when returning that the train stops at Platja Castelldefels and not just Castelldefels. The station being so close is very handy as the Taxi's were on strike for most of the week whilst we're here and also to get back to the airport! You can extend your room on day of departure if you require and availability at the rate of 10 euros per hour. The swimming pool is adequate and overall the hotel is quiet. There are no church bells going constantly close by, just light traffic noise during the day. There is a supermarket less than 5 minutes away for getting water and snacks, there's some nice local eateries but as already mentioned, the breakfast and dinner here is more than adequate unless of course you're eating in Barcelona. Barcelona itself is just a short train ride away but we visited there so many times in previous years so only went there a couple of times this holiday. Thoroughly recommended venue Best Western Hotel Mediterraneo with excellent service and staff. The hotel is well located for the beach and surrounding area. The rooms are cleaned and restocked everyday and the aircon was a godsend. Check in was easy and very efficient, especially when they realised that we were staying and extra 3 nights which I feel hadn't been communicated to them. Every one of the staff are friendly and approachable, communication could be a bit difficult but they went out of their way to try to understand what you required, their English is way better than my Spanish! lol. The reception staff were the exception to this as their English was very good indeed, and again nothing was too much trouble and all done with a smile. 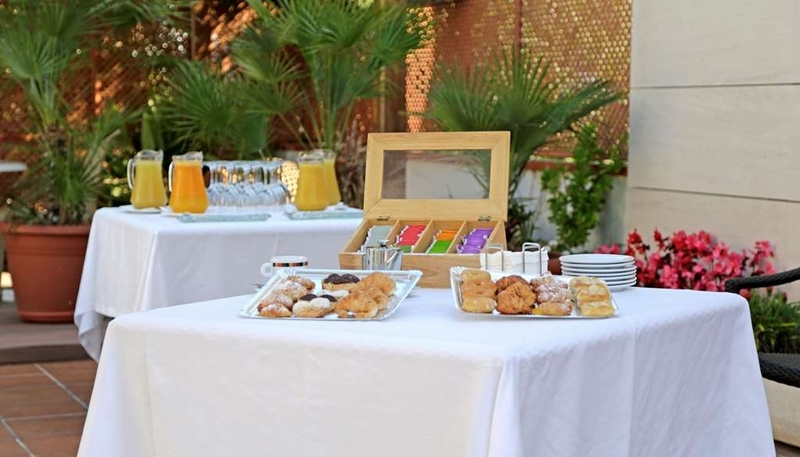 The breakfast buffet is excellent with plenty of choices for all tastes and taking breakfast outside you can sit in the tables by the pool which really gives you the holiday feeling. The pool is a good size and well maintained by the hotel, there are plenty of sunbeds to lay out on and it gets the sun all day long. The train station is a 10 minute walk away and easy to find with all trains going to Barcelona, and the hotel will give you a fact sheet to make your journey easier, as not all trains stop there on the return journey, so beware. 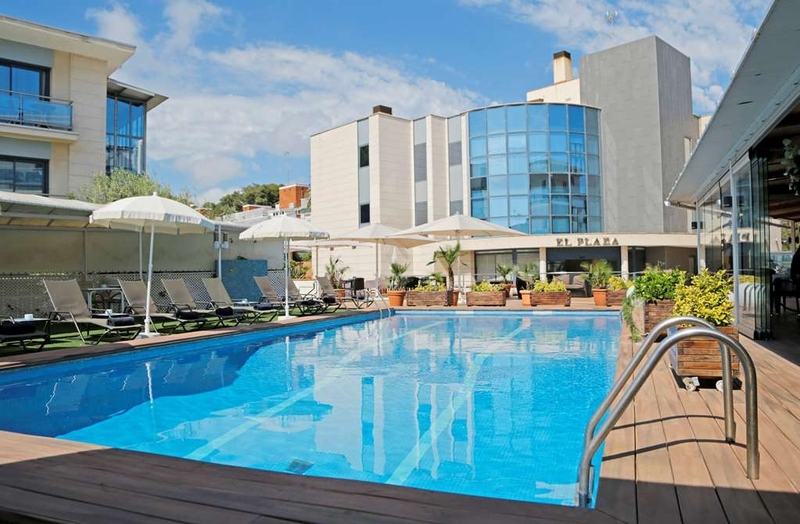 "Great Hotel for a short break by the beach and 30 minutes to Barcelona"
The hotel was in a great part of Castelldefels, in a nice residential area, away from the noise and bustle of the main strip. 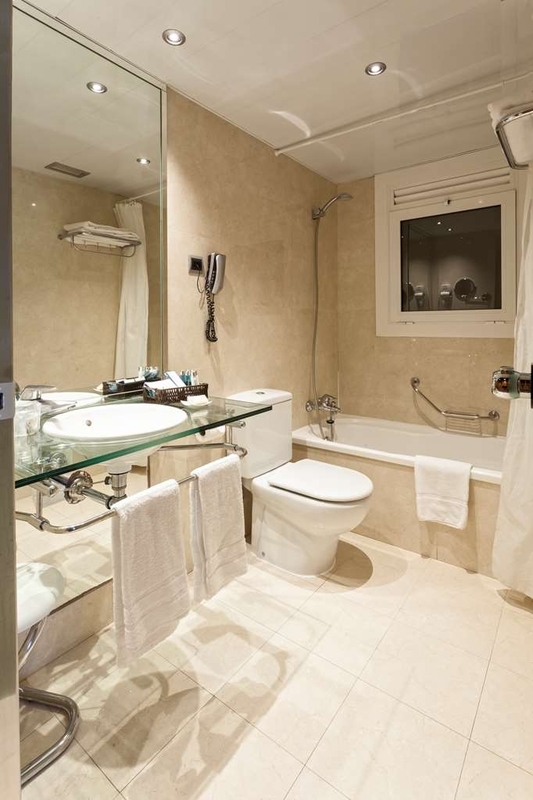 10 minutes from the train station, with easy access to the airport, Barcelona and Sitges. The hotel was small with a mixture of guests, business and those passing through and it was very low key and relaxing so great base for our 4-night visit. Very friendly helpful staff especially the reception desk. The room was clean, a little on the small side but all we needed was a place to sleep and shower so it was fine for a short break, they provided tea and coffee in the room but more coffee sachets, tea bags and milk would have been good and real cups instead of paper cups, Breakfast by the pool was a delight, the produce offered was of good quality and a relaxed atmosphere. we normally had breakfast at about 7 am and it was adequate to start our day. The beach was directly across the road with a choice of beach bars where you could hire sun loungers directly in front of the sea and they offered and nice relaxed place to retreat from the sun with nice well-priced drinks and food. We used the hotel pool on our first afternoon and last morning it was a very chilled place to soak up the sun, the lunch was good and the bar drinks were well priced. We had one dinner at the hotel after a long day in Barcelona, the meal was nice but the restaurant lacked charm, I would have preferred to have had my evening meal outside in the restaurant by the pool. The hotels location is perfect for my work visit. We could reach the airport within 20 minutes by taxi, it's directly opposite the beach and there's a supermarket less than 5 minute walk. The staff are extremely friendly and rooms are adequate. My room had a safe, hairdryer and tea and coffee facilities, there was no iron and rooms are dated and basic. The room service was poor and the restaurant opening times was hit and miss so I had to eat in the bar, food was good, however this was added to the overall invoice at the end and not included in the room, breakfast and dinner rate. The staff did remove it from the invoice after a wait to have this resolved. 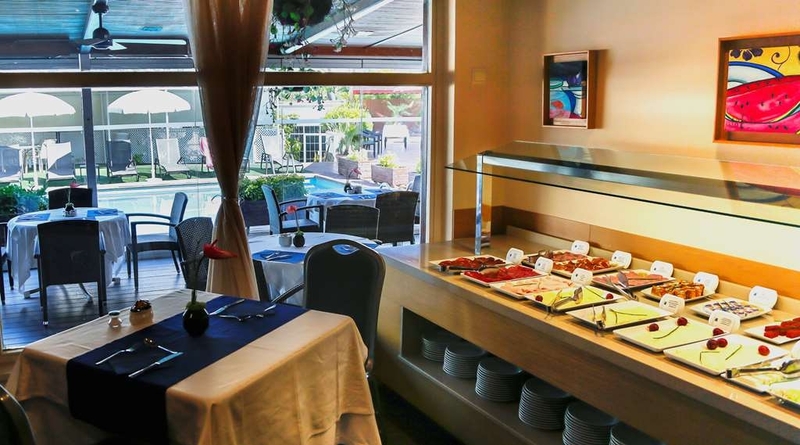 Overall a good dated hotel with free wi-Fi, fab location, food hit or miss. We've just spent a week here at the Best Western, it felt like a family run hotel rather than an anonymous chain. The reception staff couldn't have been more helpful, we arrived well before check in time but were given our room 40 minutes after arrival. Our room was spacious and airy with a balcony terrace giving lovely views of the beach and mountains. We ate several times in the restaurant and the food was very good. The buffet breakfast was excellent and varied, lots of healthy options along with the usual breakfast items. All the hotel staff from cleaners to waiters and waitresses were very accommodating and helpful. 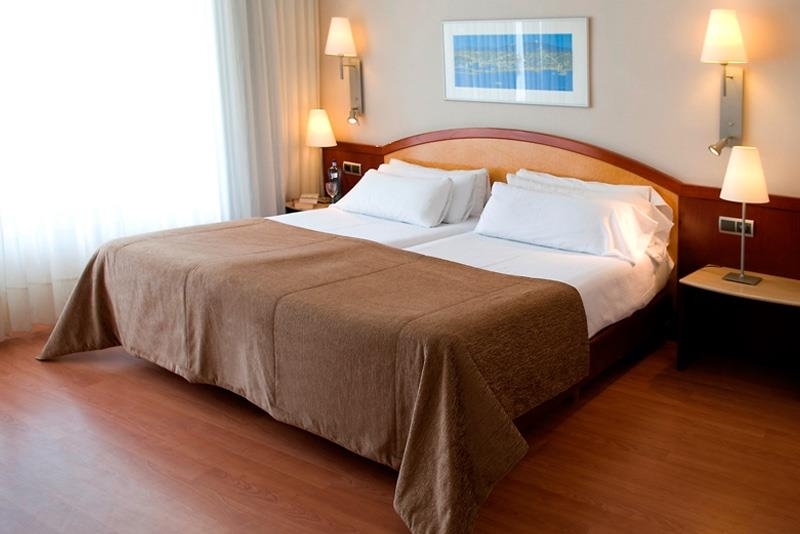 Our room was cleaned very efficiently each day and fresh towels and linen are provided. The free wi-if offers excellent connectivity. The hotel is located 2 minutes walk from the beautiful and massive beach which extends for several miles in either direction. 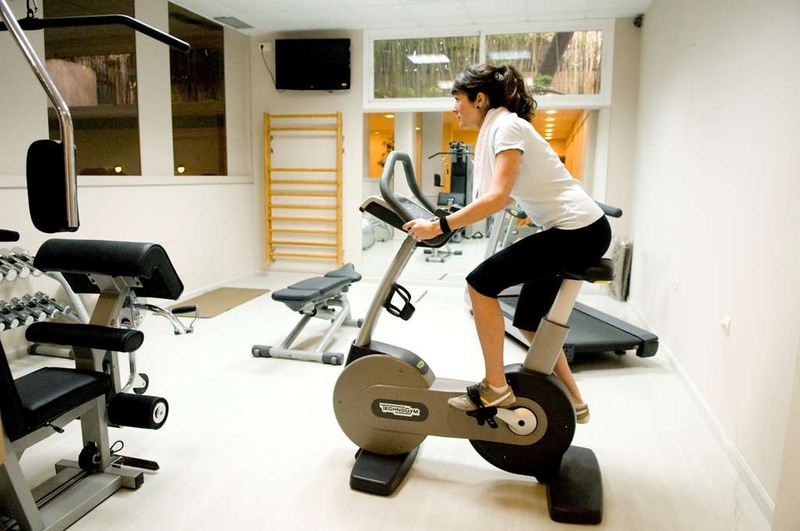 Cycles can be hired nearby and there is a watersports centre offering sailing, wind surfing, etc. There are plenty of bars and restaurants within strolling distance, an ATM is right next to the hotel and there are several supermarkets if you need to buy essentials like wine. We've been coming to Castelldelfels for several years now and this hotel was another great experience. "Talk about looking after travelers"
Castelldefels turned out to be a great beach side town, and this is a nice location. I flew from Tangiers to Barca and stayed one night before my return to the states, and I had a fantastic stay here. It reminds me a lot of the Mission Beach area in San Diego. Long boardwalk with lots to see and do. Many places to stop and have a cervesa or a bite to eat. There was a little construction going on the street but it didn't bother me, no noise at night. We just returned home to California after a seven night stay at this hotel. 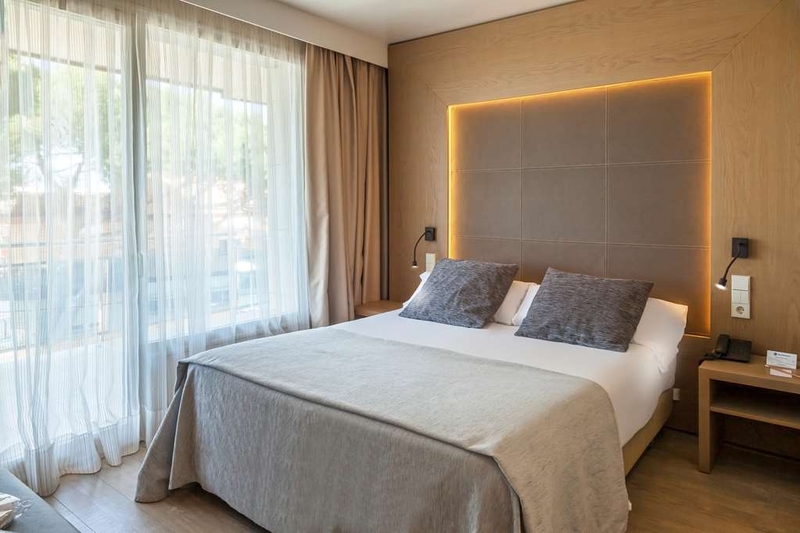 It is difficult to choose a hotel in such an overwhelming place as Barcelona, but after as I chose this hotel by the online descriptions, I was not disappointed. Perfect location if you like being very close to a beautiful beach and coastline; if you like to stroll down the streets and take in the many restaurants, and Catalan culture; if you like being close to a train station to Barcelona or Sitges; if you want to relax away from the busy Barcelona city center. Perfect hotel if you want attention-to-detail and if you want to be assisted by friendly helpful staff. (Ana, Sara, and Julien were especially helpful, and they upgraded us to the "suite" overlooking the beach. And the two staff members at the breakfast buffet were extraordinary.) 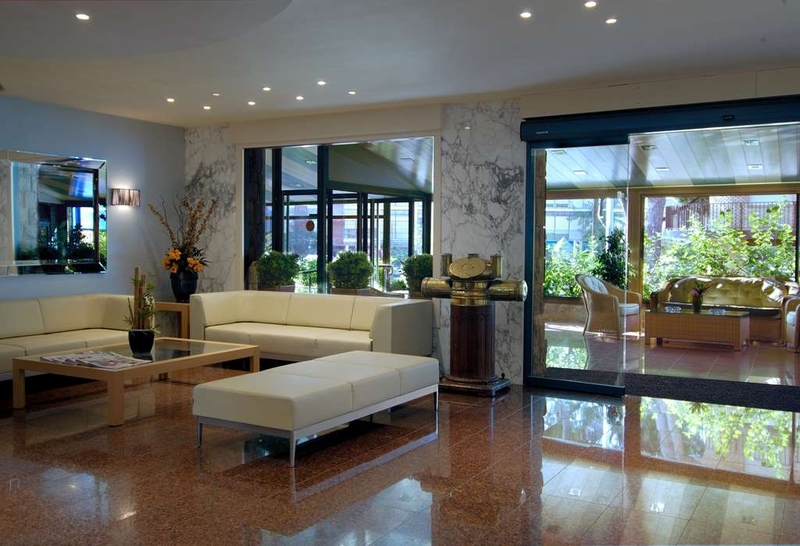 No hotel is perfect, but Best Western Hotel Mediterraneo comes pretty close. "Comfortable, clean, quiet hotel with lovely staff"
We stayed here with our 7 year old daughter in a comfortable, family room: 31 March - 5 April 2018. The room was ideal with three beds, fridge, safe, roomy wardrobe, modern ensuite bathroom and a balcony with sea view. It was also well equipped with free WiFi and TV (not that we switched it on during our stay!). If you are looking for somewhere quiet, away from the city bustle of Barcelona, with a lovely beach then don't hesitate to stay here. The hotel also has a lovely swimming pool (although not open at the time we stayed) and gym. The train station Platja de Castelldefels is only a 5 minute walk away - regular trains take you into Barcelona in approximately 20 minutes or so and regular trains will also take you in the other direction to Sitges and Vilanova il Geltru in about 20 minutes, so ideally placed. It's best to get a T10 train ticket to zone 1 in Barcelona which is better value, more convenient then buying separate tickets for each journey. You can use it on the land trains and metro for up to 10 journeys (although we managed to squeeze a few extra!). The staff here are wonderful - very friendly, helpful and obviously wanted to help make our stay as comfortable as possible. Here I must mention two members of staff in particular who, on one occasion, went out of their way to help - Alessandra & Tino. Our room was cleaned every day and we had fresh towels each day too. On the day the cleaners changed our bed linen, we came back to the hotel at about 7pm after a long day exploring Barcelona city. On entering our room, our daughter noticed one of her toys was missing from her bed - this was an IKEA white rabbit with a cotton cloth body which she'd had since she was born (Rabbity!). She instantly burst into tears and was beside herself that he was missing. We looked everywhere, pulled the beds out etc but no Rabbity could be found! She came with me down to Reception and I explained to Alessandra what had happened and I suggested he could have been mistakenly rolled up in our bed linen. She immediately spoke to Tino who said he would go through all the buckets of laundry in the basement which were waiting to go to an offsight laundry facility. The shift manager also spoke to us and assured our daughter than they would do everything possible to find Rabbity. Tino did not hesitate and started to look, asking us to give him half an hour. We returned to our room and after about 20 minutes the manager knocked on the door and delivered Rabbity! Tino had gone through all the laundry buckets and found him in the last one. Needless to say, our daughter was delighted. So a huge thank you must go to Tino and Alessandra. That evening we decided to eat in the Restaurant and had an amazing meal. My husband and I ordered Fish from the Grill (thinking it would probably be grilled catch of the day). What a wonderful surprise we had! A delicious platter of a variety of seafood arrived - salmon, hake, octopus, calamares, mussels, clams, langoustines, prawns, cray fish served with charred endive & asparagus. All wonderfully fresh. Our daughter ordered the spaghetti carbonara which was equally delicious. Desserts did not disappoint either - lovely Catalan Creme brulee, lemon sorbet and fresh fruit cake. 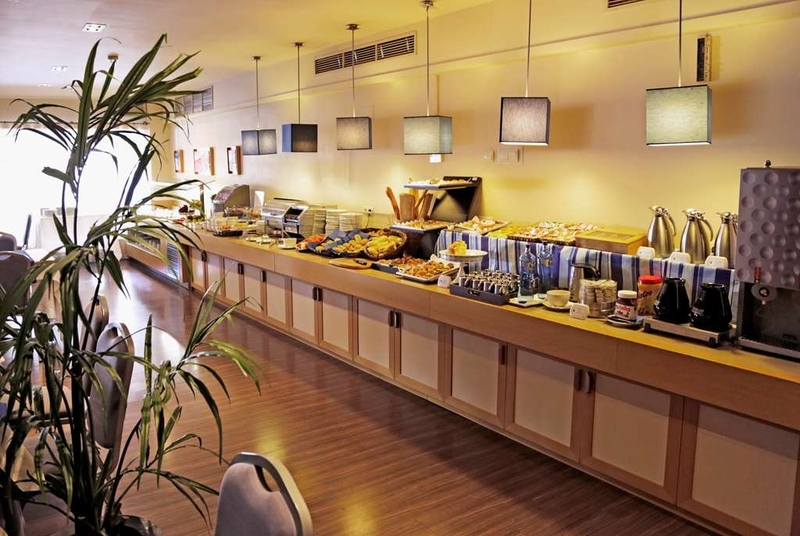 Talking of food, a wide choice of breakfast options, buffet style were available from 7 am until 11 am every day: scrambled eggs, bacon, sausages, a variety of cold meats and cheeses, fresh fruit, cereals, breads, sweet danish pastries, cake and toast. Drinks included tea, coffee, various infusions, orange and pineapple juice as well as water. Definitely something for everyone. Would highly recommend and definitely stay again if we ever return to the area. 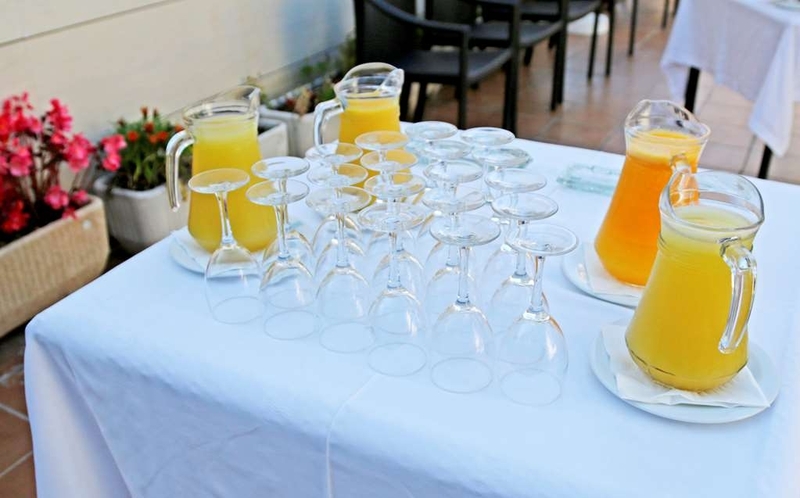 Thank you for making us so welcome at Hotel Mediterraneo. Dear Rebecca, thank you for taking your time to make such a long review about our hotel. We are happy that you enjoyed our stay with us. We are happy that you aprecciatethat we looked for your rabbit, most of us are also parents and can understand how important it the rabbit for your kid.ONce again thank you for top score. You are always welcome in our hotel and we hope to see you again. Best regards Eva. "Quiet and away from the maddening crowds"
"Great hotel , indeed :-)"
The staff and location of this hotel is fabulous. Sarah and Carmello went over and above what it take for a tourist to feel at ease. The locatioin is so close to the beach. So glad I chose this location to stay. "Close to beach and friendly staff"
The hotel is one street back from beach. Reception staff speak and understand English. Area is not touristy therefore most places speak very limited English. All rooms have a balcony but not really a view. Breakfast was average - have had much better. Main issue was milk is not provided in the room with coffee and tea. Had to ask reception staff each day. Would suggest asking for a small jug rather than having to ask each day. All in all, a nice casual and friendly place to take in local atmosphere. Take your own beach towel. There is a small supermarket down the road but staff do not speak English. "Great for a short break"
I stayed for a weekend. 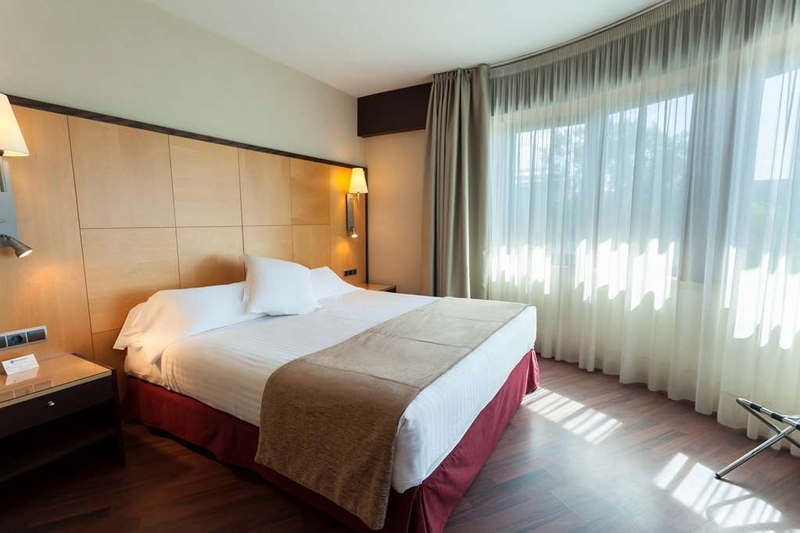 The hotel is easily accessible from the aiport and is 5 min walk from the tarinline to Barcelona with a 25 minute ride. The beach is 3 minutes away and shops and restaurants are close by. 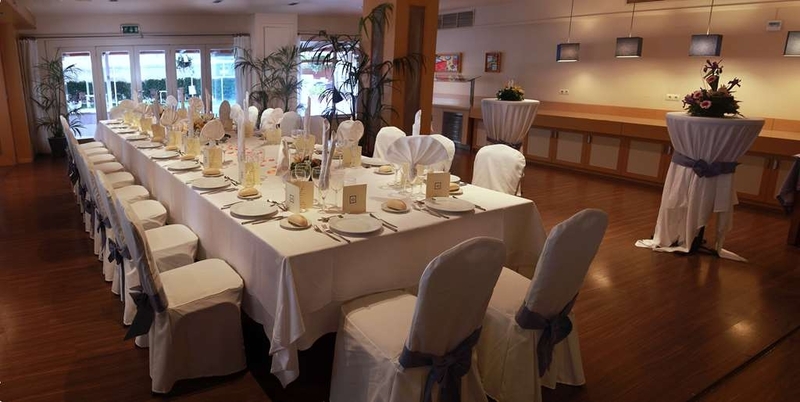 The staff were very friendly, buffet breakfast adequate and I also enjoyed a good valued set dinner one night. The room itself was basic but fine for a short break and for the price. Overall very decent. You know when you worry that writing a good review will make the place too popular and spoil it.... I was lucky to pick this hotel as a base for a weeks business. I arrived at 9 in the evening January 2016. The bar and restaurant was closed for the evening, however the reception staff arranged to make a meal and even opened the bar, just for me. the hotel room had a great balcony , was very clean bright and airy. breakfast was buffet style and never a shortage. I was so impressed with the hotel and surrounding area I've decided to return for pleasure this time and will be going back in September 2017. We stayed there as Flight crew for one night. Hotel is nicely situated in the second row to the Beach. The clean Rooms have a decent size,good beds as well high water Pressure in the shower which is sometimes a problem in southern countries. They also provide towels for the pool and as well for the beach. We left early, although the breakfast starts normally at 0700 we were offered the full selction half an hour earlier! Excellent service. Wonderful hotel, exceptional staff and great breakfasts. We enjoy our time in this lovely area by the sea. Boardwalk walks every morning and night. Close to small grocery store, food on the beach and a short walk to the train station. "Oh dear. No longer 4 star." I first reviewed this hotel in 2014, giving it a high recommendation. I have had 102 'helpful' clicks for that review. Well things have changed. Upon arrival, parking on the street is difficult. However the hotel charges 15 euros per night which I thought was excessive and asked how the street parking worked. I expected to be told the best places, what the restrictions were and how much I needed to put in the machine. Instead the owner said haughtily 'well you can park on the street if you want, its up to you'. Her attitude was very poor and dismissive. Not a good start. I paid 30 euro for two nights parking. So the rest - no visible maintenance since 2014. Tired carpets. The WiFi in the room was none existent for the two days we stayed, as 4G is poor this was annoying. Remember this is promoted as a business hotel. Bathroom - no extractor and the window won't open, glass door with a 1 inch gap - not for me. Breakfast very basic. The scrambled egg looked awful - when we asked for fresh they just put it on top of the old egg, using the same spoons (not cleaned see picture). If you want a fried egg, you pay 3 euros extra! Remember this is a 4 star hotel charging us 145.00 euros per night inc parking. In the corridor there was a tray of empty glasses.bottles on a radiator for over 24 hours (see picture) Bar was closed each night when we returned around midnight - no drinks. In the room - woken each morning to the sound of an upstairs toilet flushing down a pipe inside the wall 3 feet from your bed - not a nice wake up call. Shower had variable temperature (warm to very hot) probably dependant upon other people using at the same time. Although the balcony is large there are just 2 cheap chairs and a plastic table there. Plenty of room for decent sun lounger. Although I saw the lady owner a number of times over two days, she made no attempt to speak/enquire how things were. All in all extremely disappointing. Certainly no longer 4 star and not worth the money charged. Excellent hotel near the beach and restaurants. Hotel service was just the best all things were handled excellently. The best was the breakfast buffet next to the pool. The pool area was quiet and there was also a good sunbathing area. From the airport you can reach the hotel easily by train and from the hotel in Barcelona also by train really easily and quickly. The train station is about 500 meters away and 1 zone T-10 ticket is good for Barcelona journey. The rooms were comfortable and I had a balcony where the sun was shining at 2 o'clock up to sunset. Fortunately, I had calm neighbors as the toilet visits, the shower and also the speech was heard a rather tough neighbor from the room. I had early departure in the morning at the airport, hotel give me a breakfast picnic and a taxi was just ordered at the right time to drive me to the field. All the good staff and hope to see you, Thanks to all of you ! "Great base hotel for trips into Barcelona"
Stayed at this property for our first three nights and last night in Spain. This was an ideal location for us. Rented a car from the airport ( 15 minute drive ) then parked car in hotel garage. 15 euro. ( Needed car for future travels). From the hotel, it was a 5 to 10 minute walk to the train station. The train takes you right into Barcelona and you can return by train up to 10 or 11pm. The hotel front office staff was great, helping us with all of our questions about the area and Barcelona. The beach on the Mediterranean with a boardwalk is directly across the street. ( Great morning walk!) We were there in the off season, so very few people were around which was just what we were looking for. 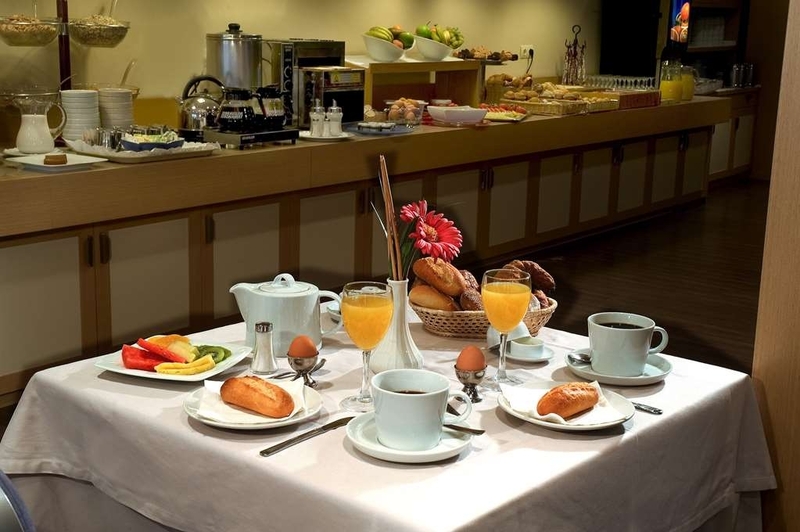 We did have breakfast included with our room and the food on the breakfast buffet had a good selection and was fine.The breakfast staff was attentive and friendly. We did not eat any other meals at the hotel. I would certainly recommend this property to anyone planning a trip to the beach or into Barcelona! "Lovely hotel , rubbish food "
Being a seasoned traveler stopping at Best Western hotels on numerous occasions. The location of the Hotel was brilliant with close easy access to the beach. Close links to public transport. The room 205 was fantastic a real treat, everything we could have asked for. We dined in the hotel on our first night and what a mistake! !, after 15 mins we was presented with a menu ( there was only us there )we ordered pizza in the main restaurant @ €17.50 for the two of us ( in my opinion it was worth nothing !! , it was dry and very unappetising for restaurant food ), we was asked the obligatory question how's the pizza with a response from me not very good !!. It was a shame to spoil what started off promising. Wont be having our evening meal here tomorrow night. Hope the breakfast is a better experience in the morning. "Nice hotel for the beach"
"Graet Location by the Beach"
We have stayed at the Mediterraneo many times for the past 10 years. Each and every time, we have experienced great hospitality, friendly staff, excellent breakfast and cosy restaurant with good food. We have had different rooms, all of them of good size, very clean and well equipped, with balcony and modern bathroom. We look forward to returning to the Mediterraneo next year. "Great Hotel and Great Time"
We stayed here for 3 nights prior to leaving on a cruise. The rooms are just the right size and very clean. The staff was outstanding. The lobby staff was very helpful and Carmelo especially was helpful and fun. It seems like he is there 24 hours a day. The breakfast, which was included, was always very good, with a lot of variety. The location is just across the road from the beach, and just down the street from the train to Barcelona. Dinners were good and reasonably priced. We stayed here 2 weeks ago and thoroughly enjoyed it. The hotel is in a fabulous location, 1 min from the beach, 5 mins from the train station and close to some good restaurants and supermarkets. The staff are helpful, attentive and professional (in a friendly way!). Rooms are clean and comfortable and the breakfast buffet is excellent. We spent a pleasant week at this well-run 4* best western hotel. The staff were very friendly and courteous and helpful in every way. The room was very modern and clean and we felt very much at home after a short time. The food was also very good as was the pool. The attractive, clean beach is more or less across the road as is also a food supermarket. The trip to Barcelona by L94 bus takes about 40 minutes - please note that you must have the exact 2.15€ fare otherwise you can leave the bus! An information sheet about the buses is available at reception. The taxi ride to the Barcelona Airport is ca. 30€ but ask the price first! Dear Scottie, Many thanks for your comments regarding the facilities and staff during your visit. 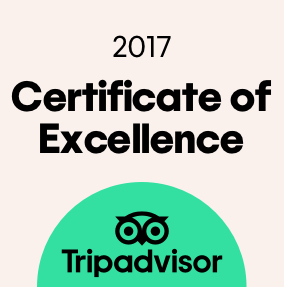 We are delighted that you enjoyed your stay with us so much and rest assured that your comments will be shared with the whole team here and read with pride. We appreciated very much again for taking the time to inform your valuable thoughts and we look forward to the opportunity to welcome you again at the Best Western Hotel Mediterráneo. Eva Gomez. Assistant Director. "Great location and nice room!" We had a lovely stay at this hotel. 8 nights and the room was well equipped and comfortable. Bathroom was clean and bright.After a slight mix up about breakfast we ended up having breakfast at the hotel, a nice variety of bread, cereal, fruit etc and usually ate by the poolside. Most days we took the train into Barcelona, went sightseeing and had lunch then we came back mid afternoon ready for a nice swim in the sea opposite the hotel. Perfect for us! Our only complaint was that the last 2 nights guests on the floor above sat out talking loudly on the balcony until 1a.m. or so. We did inform the front desk. First opinion was nice hotel, very polite friendly staff. Nice quiet outside pool . However once allocated our room and unpacked we could hear yapping dogs. We were unaware that pets were allowed, on further recognition as we noted another dog further along our hotel corridor, I would describe the section we were allocated as the dog section as not only did it smell of dog , it was noisy and balconys even though large were not at all welcoming or private, these ones are not shown in any hotel photo images. The hotel rooms could do with updating and they are very small. We checked out after one night. If you like sharing holidays with animals then on a positive note, staff excellent . Nice quiet pool area. "Nice hotel in a quiet location!" Was looking for a hotel near the beach not too far from Barcelona! this hotel seem to tick most boxes, it was clean,friendly and the breakfast was ok! However the restaurant is very pricey! and the pizza we ordered was not very nice, it felt like it was taken out of the freezer and cooked in the oven, very dry and had no real toppings! There are plenty of restaurants and bars located locally within walking distance which was a nice surprise, you can get the train, which is about a 10 minute walk from the hotel takes you to Sands and then take a tour bus which is an 'on and off' ride to Barcelona. Such a pleasant hotel, very helpful friendly staff and nothing was too much trouble. It's in a great location for the beach, train station and restaurants. Our room was a little tired but kept clean and tidy and we didn't spend much time in it. The breakfast was always fresh and plenty to choose from, and the couple of meals we had from the resturant were good. The hotel has built in front of the beach . The restaurant is not so good, my opinion is worth and also the prices are very high and not expensive . The old woman owner is not a kind and nice person and she uses rude manners with the guests. Surely I don't suggest is this hotel to my friends. Friendly, helpful and efficient service in spotlessly clean hotel, a few meters from long sandy Mediterranean beach. Perfect for our family's holiday. Easy access to Barcelona by train and not far from the airport. Must say , we had a pleasant stay here. In a way, it felt like going back 20 years in time ... Its a family owned hotel, dont expect fancy features or design rooms, just value for money. Rooms are pleasant, bit basic ( but must admit that I have high expectations) can be warm as aico didn't work very well. Clean, safe in room, coffee/tea fridge. Furniture bit outdated. But once more, value for money. Booked half board, plenty of choice for breakfast ( self service) with half board, you can choice luch or dinner from "menu del dia" . Homecooking, no fancy dishes but surprisingly VERY good, ( great fish soup/ pulpo/fish/zarzuela/ calamares) As spanish food is not really "light" , great beach , beachwalk on block from hotel, exellent for running to burn the calories. We would definitely go back to this hotel . Castelldeffels playa is nice place to stay, laid back , very local, many good restaurants visited by locals. 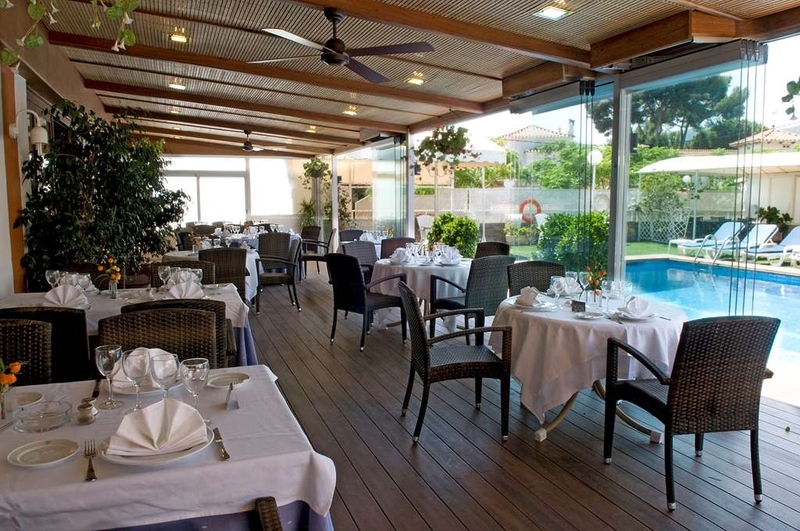 ( avoid , restaurant " la casa gallega" , paseo maritimo, unfriendly staff, overpriced, many bad reviews on tripadvisor, wich we discovered afterwards unfortunately....) Castelldefels, to sitges 10min by train ( be aware, 2 stations in castelldefels! , not every trains stops at castelldefels playa, other station far from hotel.) Barcelona, by bus ( nr94)(fast service/ 45min to plza cataluna via plza espana) buy T10, 1 zone ticket in advance (station or tabac shop) good for 10 viajes. ( 9.95€) or by train to barcelona Sants. Great stay in a nice hotel. "Not up to par "
Excellent hotel, truly ideal for all types of travellers. Breakfast fresh and excellent choice. Staff friendly, professional and attentive. Great location for the beach. Catch a train to Barcelona city only 30 mins away for 4.50 euros return. Fantastic restaurants near by although the food at the hotel is very good. Try Tibu Ron outstanding food and reasonable price. "An excellent Hotel in a good location"
This is the second time we have stayed at this hotel and it meets our requirements very well. 15 minuets from the airport close to the beach and there are plenty of good restaurants within easy walking distance. Our room was on the second floor south facing and very comfortable wit a reasonable view. Depending on wind direction the hotel is on the flight path for aircraft landing at Barcelona airport although the noise is minimal. The breakfast buffet is extensive and very good quality. the hotel restaurant, which we used for the first time this visit, was also excellent with an extensive and good quality menu and the service was top class!! Location excellent just a two minute walk from the beach. Rooms spotless and entrance pleasant with wild birds and a jungle type setting with plants/flowers everywhere. The price wasn't cheap. €90 off season per night is expensive. Car parking is non existent and hidden underground. If you visit between Oct 1-May 1 the street parking is free so just park up and leave it nearby. There is absolutely NO soundproofing of the rooms. You can hear everything next door and I mean everything. It's not a bad place just a bit mediocre really. "Good location if you want to spend time on the beach." There was no place to park near this hotel in order to check in and so I parked illegally outside the front door and went to the front desk. They informed me that I could park in the underground garage for an extra fee, which I did because every parking space in town was taken. If the hotel had provided a tip about the parking ahead of time it would have been very helpful, as I circled the block for half an hour. I've stayed in a lot of Best Western Hotels in Europe and they usually have a much higher standard than the ones in the U.S. This one was not that great, but it was still better than ones I've stayed at in America. The staff were very attentive and friendly. I was the only one in the dining room for lunch and thus had the undivided attention of the waiter - maybe a little more attention than I needed but still better than not getting any service. The room was clean but wifi was, as usual, weak. Drive around the hotel until you see the driveway that goes under the building. The camera allows the staff to see who wants entrance and they will open the door if you are staying there. Stayed here for a few nights while working in the area. Staff were great and looked after us very well. We needed early dinners in the evening and they were very obliging. Food was great didn't want to eat anywhere else. Made our visit to the area very successful. Stayed here this week while working locally. We could not have wished for better service on our return each evening. As we were setting off early the restaurant were most helpful in arranging meals as soon as they opened. The food is excellent with a number of tasty fish dishes as well good meat and veggie dishes. Can definitely recommend The Gambas and the paella. Will definitely be returning even if it is to just to have a meal. I chose this as an alternative to overnighting in the city or right by the airport where I had flights in and out of Barcelona. I was delighted with this informal and comfortable hotel which is well positioned for the sea, the station and the airport and yet is quietly placed a few streets away from busy activity. The breakfast was excellent and I had my supper in the bar the night before which was also enjoyable. Lovely staff and lovely hotel. Warmly recommended. stayed at this BW for 2 nights, and choose it because I have a rewards card. You see, sometimes it works for the hotelchains to issue membershipcards and points. I regret choosing this hotel in Castelldefels, as I stayed at another hotel there before, which was booked by somebody else for me. Anyway, the stay here was not uncomfortable or something. It was ok, no complaints but the other was better. Here, the bed was good, room ok, breakfast super, staff friendly. During winter it is quiet of course. I wanted to use the sauna, but had to book that in advance as it would take 3 hours to heat up. Fabulous hotel position, fabulous staff friendly and the restaurant well worth just staying in for. Perfect for day tripping into central Barcelona, short walk to station then direct line into main Barcelona. Or if you fancy a beach day, just cross the road and a fabulous beach. "Beach location with easy access to train to Barcelona"
This Best Western is quite nice because it is small with only 67 guest rooms. The receptionists are very friendly and welcoming. We were checked in promptly with English speaking agents, Elizabeth and Arnau. They were very helpful with suggestions and directions regarding tours, trains and dining options. We stayed in Room 116. It is a corner unit with a wrap around balcony overlooking the pool. It is the end unit furthest from the main street. The bathroom has all the amenities and is fully stocked with supplies. The bar area is nice with outside seating. The breakfast buffet has a nice variety. 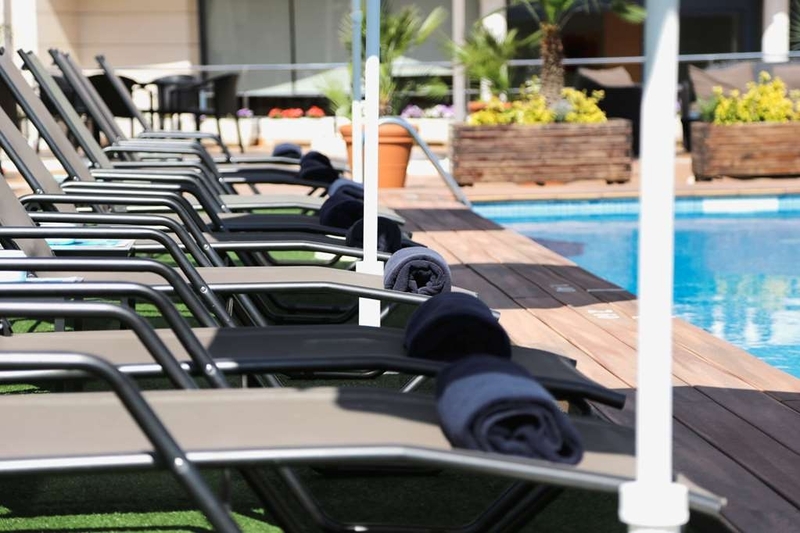 This hotel is close to the airport and just a few shorts blocks from the train station to go to Barcelona. It is in a good location directly across from the beach with a many restaurants nearby. "Average four star hotel.... Good location"
We stayed here in September for a week. 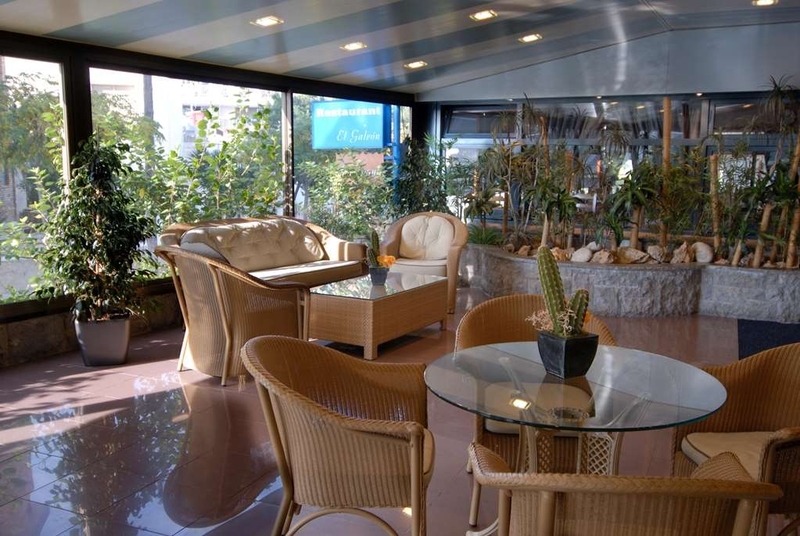 Friendly staff, especially in the restaurant, good breakfast, pleasant room, near the beach and good restaurants, Easy walking distance to the station and easy access (such cheap fares) to Barcelona for sightseeing. We will definitely go back. "ALWAYS RECCOMEND AND GREAT POSITION"
value for money and near sands and sea. Super bar and hotel position near restaurants and bars. perfect for families and super pool and I cannot recommend highly enough for business or pleasure. ideal for Barcelona 20 minutes away on train. recommend to all. Booked in for one night on way to the airport at Barcelona (13 mins drive). Inexpensive and comfortable. The room was good, with a balcony for those smokers but not so much of a view. Very close to the beach. Best free WiFi in a long time, 30Mb down, 9Mb up and 7ms ping good for gaming. Shower was good but water temperature fluctuated due to not being thermostatically controlled - read, hot, hot, hot, cold, hot etc. Probably better outside of peak time pre-breakfast. Breakfast (included in my deal) was as expected except for the 'hot' food which had gone cold and was brought back out, microwaved and put back into the serving dishes. Too risky for me - therefore fruit/other options were consumed. Staffing out of season might be an issue - overall happy with what I experienced but probably only good for a couple of days - not for a longer duration. Dear Brooksa. Thank you for taking you time to give us your feedback regarding your recent stay at our property. Your business is very important to us and we value your feedback. By telling us what you liked about your stay and how we can improve, you are helping us deliver a superior experience for you and other guests in the future. Regarding you comment of breakfast we will checked what happened. We hope you will come back and see us again soon. Thank you again for taking the time to complete the survey. Sincerely, Eva Martínez. 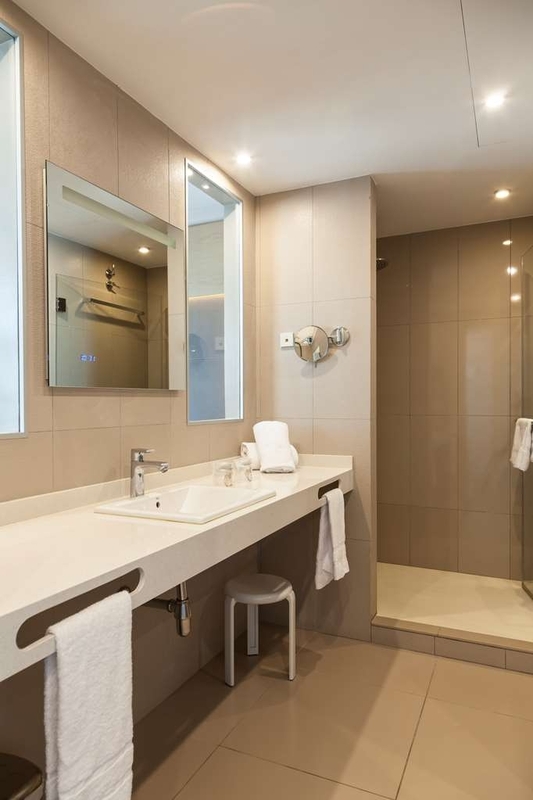 "Good choice but needs some attention to cleanliness"
Good sized, air conditioned room which was generally clean but why do some hotels put a label on the toilet saying it has been sanitised when it has not been properly cleaned? Generally a good hotel, but small points like tis let it down. We just spent seven nights at this hotel . The hotel is very nice and clean. The staff was very friendly and helpful. The food was expensive but very good. Breakfast cost 13 euros with a good variety of food available. Although expensive, the convenience of eating at the hotel was a determining factor. The choices to eat outside were very limited. The lunch and dinner options in town were complicated by the fact that were served much later than what we are used to in the US. Dinner was not available until 8:30 pm. Lunches began at 2:00 pm. As others have reported, the train is a 5-6 block walk and takes about 30 minutes to reach Barcelona. Following the Hotel's written flyer, we took the train to Passeig de Gracia and walked about 4 blocks to Placa de Catalunya the main Placa in Barcelona and the starting point for most tourist attractions. The return trip via train was on any train labeled "Vilanova". The hotel is a few minutes walk from the beach. Perhaps we were late in the season, but the beach chairs were limited and expensive. A chair in the shade cost 15 euros as best we could tell ( we were only interested in a few hours ). There was little to do in the evening.The hotel staff was very helpful and the maid service was as good as we have ever experienced. The problem with the hotel was with the bathroom! It was very clean and attractive. It had a glass counter top with a glass bowl sink. The tub/shower had a glass partial wall that was about 3 foot long and swiveled moved back and forth over the tub.While very stylish, it was difficult to use the sink without spraying water all over the countertop and the tub/shower was impossible to use without flooding the bathroom floor. The tub was designed for bathing, not showering, and it was very unstable when you were standing. Showering became an unpleasant and dangerous experience, particularily for anyone with balance issues. The tub was deeper than what we were used to and hard to enter and exit especially with the wet floors. Next time we will stay in Barcelona rather than here simply because we found nothing to do in town once we returned from touring. Nice hotel, nice breakfast , lunch, ate in their city or in Barcelona , about one and 15 minutes from my hotel to famous shopping street . Nice pool area. Get room with balcony , facing ocean ,though you don't see ocean . Block from beach. If I went back, would stay here. Often travel on business to this area and normally stay in Gava. This time the usual hotel was full so selected this hotel instead. I arrived around 8 pm and part of the hotel was unlit. I checked in and was escorted to my room in another building....the corridor towards my room was in darkness and wondered what type of hotel I had chosen! In the morning everything seemed a lot better but my room didn't have a balcony so as I went to breakfast I checked if there was s room with s balcony available and there was. The reception staff told me to pack my case and leave it in the room and they would move me while out at work. When I came back I had s room with a balcony towards the front hotel! Wonderful!! I enjoyed my breakfast over looking the pool and as the hotel was quite small it was an enjoyable experience with a good selection of good! All the staff were very friendly and the hotel was very clean. Just across the road was the beach and a supermarket less than 100 yards away. Will definitely be booking into this hotel the next time I am in the area. Thank you to everyone at the hotel for making my stay so pleasant.